Veteran defender Rio Ferdinand, a player who made it very clear how unhappy he was at missing out on England’s Euro 2012 squad, has criticised manager Roy Hodgson both for not giving the youngsters a chance and for playing too defensively. I can’t see Jordan Henderson being too pleased with that, can you? 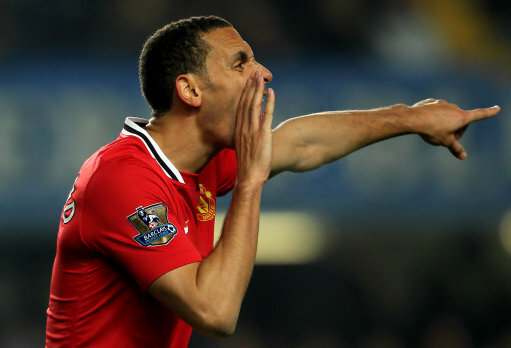 Anyway, you can read more of what Rio has to say in pretty much all the newspapers today. But one question remains – should Ferdinand, who may still have a part to play in future England squads, be publicly criticising Roy Hodgson’s tactics? Me, I think he should show a little bit more class and keep schtum. Thanks for that Rio. Would have so much better with kids like you maybe. Oooh them grapes are a little sour. a 33 year old defender who was upset about his dismissal from the squad claiming that the team was too old and too defensive..
Yeah not sure his inclusion would have made any kind of difference at all. The hypocrisy of it all really. A 33 Year old who whined about being left out says we should have played young players. Wut? henderson was the wrong choice, jones should have been played to do exactly what rio points out, he did it countless times at united this season delivering final balls to rooney and welbeck. This could have been pivotal. Did Rio say anything about his team mate Rooney being complete gash whenever he puts and England top on? Judging by the pre-tournament build-up, labeling England’s campaign as a flop seems harsh when there were low expectations in the first place. Rio criticized Roy for not picking him before saying that old players like Gerrard and Terry were selected. Now he’s saying the squad was too old. Don’t bother listening to him. Let me get this straight as I’m a bit simple, this is Rio Ferdinand comparing the lack of success in 2012, when no-one actually expected us to do anything, with all of the international trophies we amassed from every international tournament won on his watch since he first made the England squad in 1998. And the nub of his criticism seems to be based around the squad being too old and defensive, which his inclusion for 2012 which he was bitching about a few weeks ago, would have simply sorted out in one fell swoop. Funny how in the previous round when rooney scored the goal, uk fans all suddenly call him a “brave hero”. and now hes a flop because he got absolutely no service from the most boring “winger” ever james milner and mr. headless chicken scott parker. Put messi/ronaldo with scunthorpe united and well see if he can still score 40 goals. Wake up football “fans” and crit the team selection and not 1 man. liverpool arent even top 4 or champs league yet half the england team is made up of em. FAIL. It ain’t Liverpools fault that we actually have some english players, son.